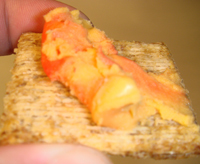 When I was growing up my aunt used to always serve WisPride Port Wine cheese at events she hosted. There’s something so awesome about it, my sister and I looked forward to it every time we went there. My aunt moved to Florida when I was in 5th grade and that was pretty much the end of Port Wine cheese for a while and I have it now as an occasional treat. It never occurred to me to try a different brand until now so when I saw Merkt’s version at the store I picked it up along with a WisPride and brought them home. Very spreadable (as the package says) and creamy. I don’t even know if it’s the cheddar or the port but something gives it a nice tangy taste. There is also a nice saltiness to the blend. Ethan liked how the cheese and port isn’t too mixed so you can pick out cheese with more or less port. This was pretty much the same but felt it was a little bit creamier but also a little sharper too. Ethan thought the port part was somewhat better as well. After looking at both containers we saw they were both made by the same company so that explained the similar tastes but I think it’s worth noting that Mertk’s is aged for 9 months while WisPrise is aged for 6 months. I’ll say this was a tie because they are so similar and if you’re in a store trying to decide between the two you won’t be disappointed with either. For me they were pretty much the same but I will point out that even though both of these were in the fridge after the evaluation, for the rest of the week when Ethan wanted to snack he chose the Merkt’s. Port Wine Cheese: WisPride or Merkt's? Never heard of port wine cheese! Looks interesting though. 🙂 Don’t think we have in in australia though. And spreadable too! 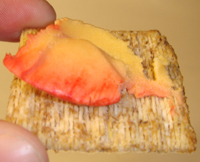 Excellent use of Triscuits! I’ve tried and Alberston’s store brand that was pretty good. Ah, Wispride Port Wine Cheese Spread. A guilty pleasure of mine since I was a kid. It’s kind of like high-class Easy Cheese. I love it. i grew up with merkt’s, and it will always have a place in my little wisconsiny heart. in fact, my family in Cali loved Merkt’s so much that when we visited them, we took a half-dozen frozen Merkt’s containers with us. Hey Michelle, I happened to be browsing through the Phoneix today at lunch and saw the write-up about this blog. Pretty cool! I’m from WI and I’ve never heard of ‘WisPride’ – weird. It was always all about Merkt’s. 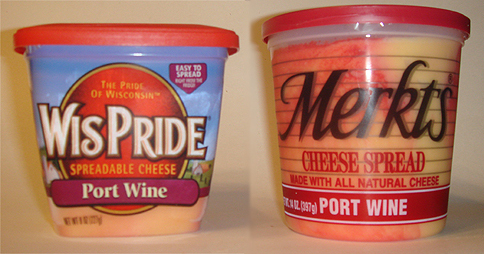 Since Wispride Port Wine Cheese is no longer available in our area — southern NJ — we picked up some Merkt’s. It’s God AWFUL!